This is the story of a Mighty Girl with cerebral palsy, our 4 year old granddaughter Maya. She is a bright shining light in our life and the lives of all who know her. In a few months she will be heading to St. Louis, Missouri, from Michigan to have a LIFE- CHANGING surgery called selective dorsal rhizotomy (SDR). Her doctors predict this surgery will one day allow Maya to WALK INDEPENDENTLY, a dream come true for our fiercely independent Mighty Girl. I started this fundraiser to help raise money to cover costs related to the surgery and post-surgery therapies. The most pressing cost is her post-surgery physical therapy (PT). Maya's insurance only allows for 30 PT visits per year. In the first year after surgery Maya will require well-over 200 PT visits, at a significant out-of-pocket cost (each visit is billed at more than $150). Maya’s parents (our daughter and son-in-law) are always the first to help others, but are reluctant to ask for help themselves. We want them to know they don't have do this alone, so let's rally around their Mighty Girl and show them how much joy she has brought to our lives. Please take a minute to read Maya’s story and consider donating and sharing her story. Maya was born very early in the fall of 2013, a micro-preemie weighing only 1lb 10oz. Before her mom and dad even got to hold their sweet girl, she was rushed to the NICU in a hospital three hours away from home. Maya spent the first 87 days of her life in the NICU fighting to come home to her loving parents and two big brothers. After several scary setbacks and interventions, Maya went home without any hint that there was anything seriously wrong. It seemed like she had beaten the odds. Once home, Maya thrived with her family’s love, meeting most of her developmental milestones right on time. However, as time went on, her mom noticed her legs were often tight and Maya wasn’t meeting some of her motor milestones, like sitting up, crawling and walking. Though the doctors said she just needed time to catch up, a mom knows when something’s off. My daughter, the best mommy, and advocate for her girl pushed hard for an MRI. Maya had her MRI just before she turned two and was officially diagnosed with spastic diplegia cerebral palsy (CP). Maya’s type of CP causes the muscles in her hips, legs, and feet to be tight or spastic. Because of her CP, Maya is currently unable to stand on her own for more than a few seconds, or walk without the use of walker. Despite these challenges, Maya gives it her all every day. If her brothers play baseball, she plays baseball; if her friends are climbing a snow bank, she’s right behind them in her walker. She has an incredible will and a tenacious attitude. Every week, Maya spends countless hours in outpatient and in-home therapies to try to build strength. She often misses out on “typical” four-year-old things because she is at therapy, in the car on the way to therapy, waiting for therapy to start, at a specialist appointment, etc. Still, Maya is self-motivated to practice things like balance on her own at home. Even through the hard work, she’s smiling. If you ask her if she needs help, she always says, “no, I got it.” She wants to be mobile and she wants to walk “just like her brothers.” She rarely complains and always has a bright smile for those she encounters. 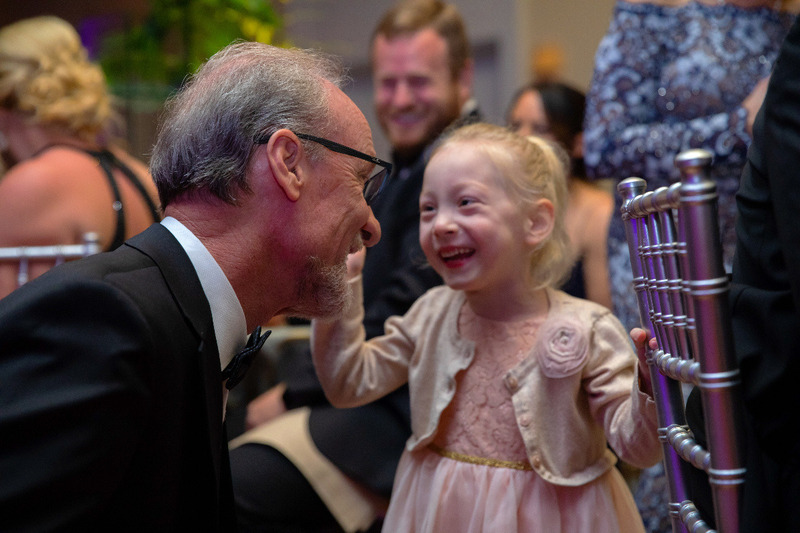 We have seen first-hand how much joy she brings to those around her. Maya has had to go through so much in her short life. She’s had multiple rounds of Botox, endured painful daily stretches, spent time in special standers for prolonged stretching, etc. to try to ease her uncomfortable spasticity. Unfortunately, these are only temporary treatments for a lifelong condition. 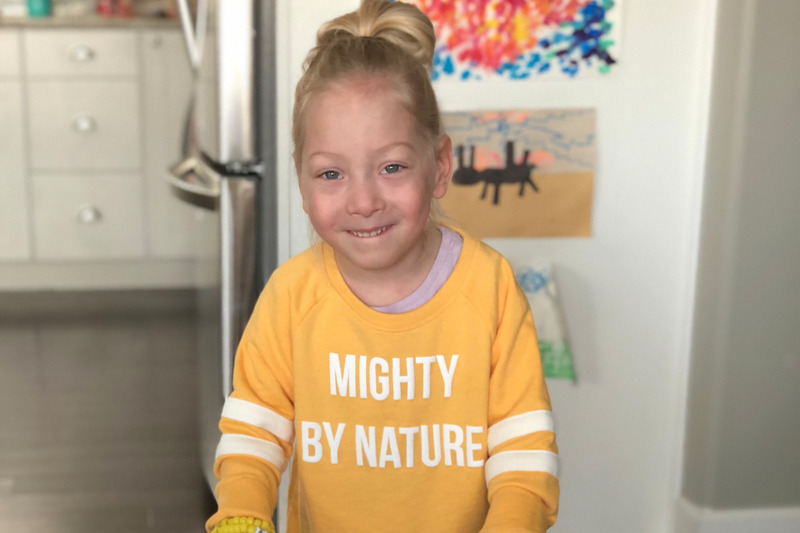 As she grows, her spasticity will likely lead to multiple orthopedic surgeries, permanent changes to her bones and joints and, like so many others with CP, she could lose her current level of mobility. After learning that Maya could lose her current level of mobility due to prolonged spasticity my daughter and son-in-law began searching for better treatment options. After countless appointments with specialists and lots of research, they learned about a life-changing surgery called Selective Dorsal Rhizotomy (SDR). During SDR, a surgical team will expose the spinal nerves, use electromyography (EMG) to test each nerve in order to determine which are causing the most spasticity, and then selectively cut those abnormal rootlets causing the most spasticity. This surgery is the only option to permanently reduce Maya’s spasticity, giving her the ability to live with less pain and greater mobility. Maya has had extensive evaluations at multiple hospitals and is considered an ideal candidate for SDR. On March 27, Maya and her family will travel to St. Louis Children’s Hospital in Missouri. Once there, she will undergo SDR with Dr. TS Park, one of the nation’s leading pediatric neurosurgeons and a pioneer of this innovative, transformative surgery. After her surgery Maya (along with her mom) will begin a five-week, intensive in-patient rehab in Grand Rapids, Michigan, at Mary Free Bed. It will be followed by a year or more of intensive out-patient physical therapy back home. The intensive PT is crucial for Maya to regain strength and to train her brain and body to work together to walk. Dr. Park has predicted independent walking for Maya post-SDR (and intensive PT). A dream come true for Maya! This Mighty Girl has had an incredible will and spirit since the day she was born. It’s been a privilege to watch her show the world what she can do. Now, let’s show this girl some love and support as she continues to shows CP who’s boss. Thank you for taking the time to read about and consider helping our Mighty Girl! *This is a continuation of Maya's YouCaring Fundraiser. YouCaring was bought by GoFundMe and accounts closed (July 31st). All YouCaring donations ($26,585) have been added to this fundraiser to help us reach our ultimate goal of $50,000. We are more than halfway to our goal! Thank You! Keep Sharing! What an amazing couple of months it’s been. Maya continues to work hard on in physical therapy at home, in school and with her team at LBB rehab. Her hard work is definitely paying off. She is starting to walk more and more, in fact she is walking so much that we have stopped counting the number of steps she can take in a row, we are now measuring her walking distance. 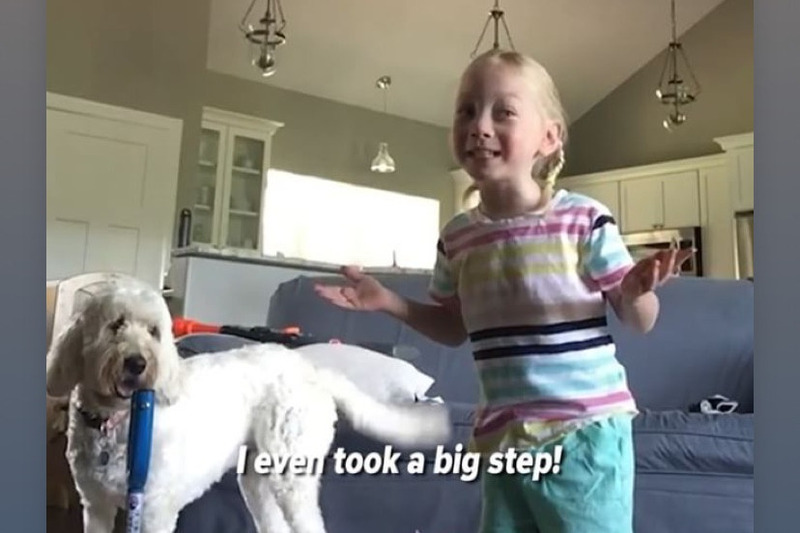 Maya has also been working on walking up and down stairs with her single point canes, standing up from the floor, standing balance etc. and per usual she is crushing it. In other BIG NEWS one of Mayas dreams came true when she got to meet Winter and Hope at the Clearwater Marine Aquarium. 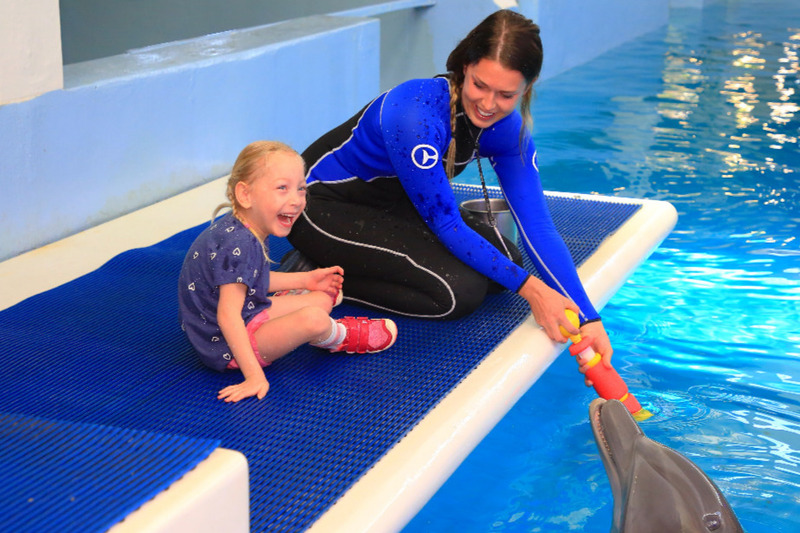 If you haven’t watched Dolphin Tale or heard of Winter the dolphin, check it out, or give Maya a call, she will be happy to tell you about it. The whole family got to go out on the platform and interact with the dolphins. It was AMAZING and so inspirational for Maya. Maya also got to face-time with one of the actresses from the movie and was one of the guests of honor at the aquarium’s annual fundraiser. We were so proud of our Mighty Girl. She got up in front of a huge crowd of adults and spoke about her cerebral palsy, her therapy, and what Winter has meant to hear. She got a standing ovation when she walked from our table to the podium ALL BY HERSELF. This was a moment we could have only dreamed of before her surgery. During her speech Maya was asked what she would tell others facing challenges like hers. Her message was clear “Don’t ever give up.” I am tearing up just thinking about that moment. We have come so far and we don’t take that for granted for a second. So many people have asked, what’s next? What’s next is a lot of what we have been doing including more physical therapy, aquatic therapy, hippo therapy, occupational therapy, etc. We are also looking into a couple of intensive therapy weeks at St. Louis Children’s Hospital and/or NAPA therapy in Boston. We feel like Maya could really benefit from these intensive bursts of therapy to get her to the “next level” of functional independence. Thanks to all who have already donated to help our Mighty Girl. We are forever grateful. Our insurance company won’t pay for many of these therapies, surgeries, and equipment because as they say in their denial letters “she will not progress, Cerebral Palsy is a lifelong condition...” Well we think she has proven them wrong and will continue to prove them wrong. Wow! Our Mighty Girl is lighting up the world with her first steps. We have been blown away by how much her video has touched people across the WORLD. We have been getting messages from people as far away as France, Brazil, Germany, Japan, and Australia. The video has gone viral and has been shown on ABC Nightly News (see link below), The Today Show, CNN, The Talk, The Dad Break, The Daily Mail, CBS and countless other media outlets. So many are moved to tears by her pure joy and milestone moment. This is a HUGE milestone, but it is only the beginning. Maya will continue to work 6 times a week at physical, occupational, and aqua therapy. She will also begin hippotherapy in the fall as well as attend some of the best intensive therapy programs in the country. This is all necessary for Maya to achieve full, independent walking. It is going to take time and lots and lots of continued therapy but she is up for the challenge and so are we. We can’t wait to build upon this amazing accomplishment and push forward. Please continue to share this fundraiser with your friends and family. Help us ensure that Maya never misses a therapy session because of costs. Only 26 days to go before we leave for St. Louis. Yay! Maybe by then we won’t have snow on the ground. Maya’s surgery is scheduled for May 9th but we will be in St. Louis starting on the 6th for testing and pre-op appointments. We expect Maya will be in the hospital about a week post-op and then we will head back to Michigan for in-patient rehab for an undetermined amount of time. Maya is feeling better and is back to her regular PT and OT schedule after her bought with pneumonia. She lost about 10 percent of her body weight while she was sick so we are trying to plump her back up to a whooping 28 pounds before surgery. It’s always difficult to get her to gain weight because she burns so many more calories than the typical child when she moves. She’s getting lots of chocolate milk, pasta, butter, cream cheese, more butter, more cream cheese, more pasta…It’s rough. Local friends, don't forget to stop by Rare Bird tomorrow, April 11 from 3 pm -12 am. Rare Bird Brewpub is donating half of all Rare Bird beer sales and $1 of any other drinks to our Mighty Girls surgery fund. Join us all day for some good cheer in one of the coolest pubs in town. Thanks for your continued support of our Mighty Girl. Keep those positive thoughts and prayers coming!